Green Turkey Tortilla Soup is the ultimate leftover. I’m a teensy bit ashamed at how long it took me to stumble upon this recipe. Turns out that I’ve had the base for an amazing Green Tortilla Soup for ages. But I was foolishly only scooping out the flavorful meat of my Turkey in Green Chile Sauce and then discarding (gasp) the awesome leftover stock. My first batch only made two servings. I was about to eat the second bowlful myself but my pride helped me to stop and share. 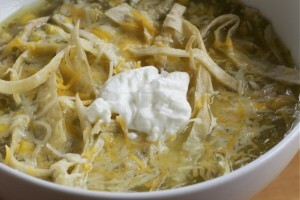 I needed confirmation that Green Tortilla Soup was as amazing as I was thinking. I wanted to see the look on my husband’s face when he tried it. It was so worth it. I’ve increased the sauce quantities in the Turkey in Green Chile Sauce recipe so that I can now get a complete bonus meal for four out of the soup. Pour leftover sauce into a large sauce pan and begin heating over medium heat. Add in corn and lime juice. Cover and simmer until heated through. Meanwhile, put tortilla strips on a baking sheet, spray them lightly with oil and bake until crispy – about 10 minutes. Serve soup warm in large bowls, topped with a handful of tortilla strips and your choice of toppings (sour cream, cheese, more cilantro, hot sauce, etc). I prefer sour cream and just a pinch of cheese.